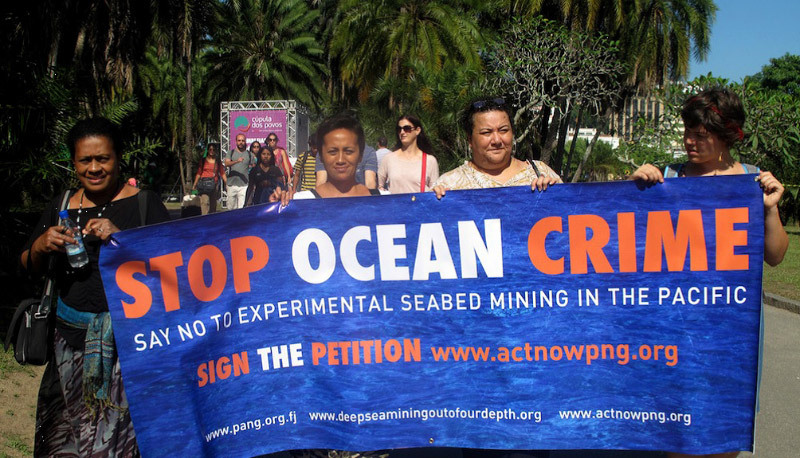 Proposals for seabed mining, within the jurisdictions of nations have concentrated on six nations or areas, namely New Zealand, Australia, Namibia, South Africa, Mexico and the Pacific Islands (Fiji, Papua New Guinea, Tonga, Vanuatu, Solomon Islands and Cook Islands). There has been considerable resistance to these project proposals in all these cases and in most cases, governments have opted for a cautious approach in the form of a moratorium, permanent bans or refusal of project proposals. 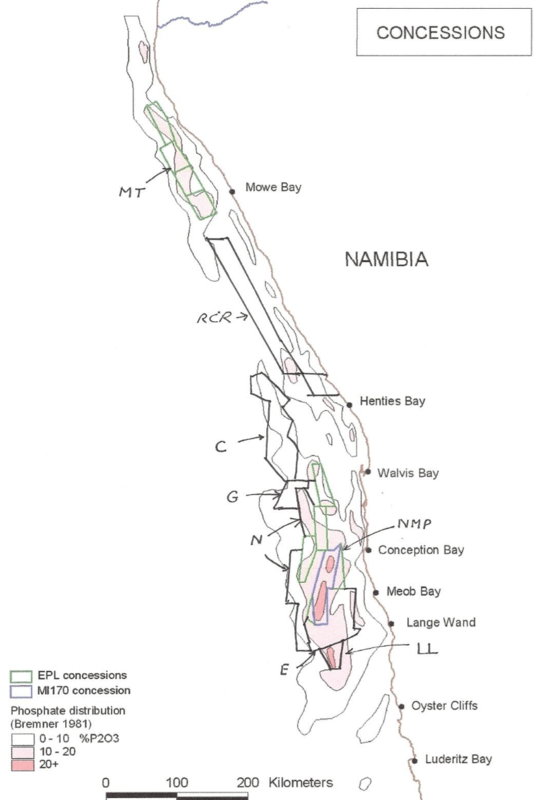 As part of the Environmental Impact Assessment specialist studies were undertaken that included potential impacts on seabirds and marine mammals, fish and fisheries, water column dynamics, macrobenthos and jellyfish.There was considerable opposition to Namibian Marine Phosphate’s Sandpiper Project proposal. A number of civil society organizations (local and national) including Earth Organisation Namibia, the Deep Sea Mining Campaign, an affiliate of Friends of the Earth, and Swartkopmund Matters and fishery industry associations, including the Namibian Hake Fishing Industry Association and the Confederation of Namibian Fishing Associations strongly opposed the granting of rights and campaigned for a review of the decision. A number of strong objections have been raised against the Sandpiper Project, including direct destruction to benthic habitats; release of hydrogen sulphide concentrations, release of heavy metals and bioaccumulation in the food chain in turn impacting on fisheries, reduced phosphorous content in the seabed which results in oxygen depletion and toxicity of processing plants on shore near Walvis Bay. The Minister of Fisheries and Marine Resources championed the campaign for a moratorium in Namibian government. This led to the establishment of an 18 month moratorium on phosphate mining, put in place through a cabinet decision in September 2013. The decision outlined a number of concerns from the Namibian Government. Government is concerned that the removal of soft sediment from the seabed along with living organisms and the suspension of fine sediment in the seawater may affect the functioning of the marine ecosystem negatively. The ministry is further concerned that any contamination or suspended particles from mining activities may have adverse effects on the fish larvae and their development and thus [we] need to investigate the breeding and nursing areas, breeding patterns of the commercially important species in relation to the mining activities, as well as the current dynamics. Shipping bulk wet sediment to land-based processing sites poses risks to the marine environment associated with loading, transport, processing, especially the waste in the sea, importantly if fertilizer factories are planned. The Namibian government has subsequently commissioned an independent study and Environmental Impact Assessment of the impacts of marine phosphate mining aligned to broader Strategic Environmental Assessments on the Namibian offshore marine environment. The Fisheries and Aquaculture section of the Norwegian-based Foundation for Scientific and Industrial Research (SINTEF) and the Institute for Marine Research are conducting the studies. Draft reports related to the overall plan for the Strategic Environmental Assessments have been completed by SINTEF. Is committed to ensure that proper scientific investigations are carried out that will allow it to make an informed decisions about the future of phosphate mining in Namibia. After expiry of 18 month moratorium period, the Minister of Fisheries and Marine Resources has publicly declared that the moratorium will remain in force for a further three years with possible further extension. 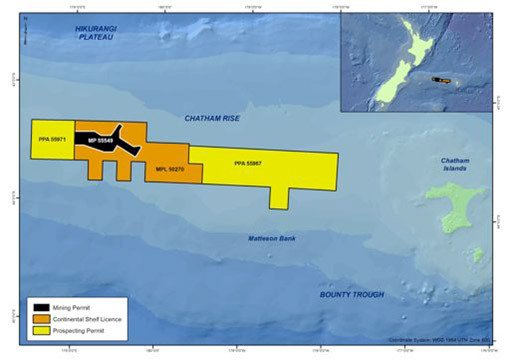 On 14 May 2014 Chatham Rock Phosphate Limited applied to the Environment Protection Authority (EPA) for marine consent to mine phosphate in Chatham Rise, 400 km east of Christchurch. The application sought consent for seabed mining operations over a 10 192 km2 area for a 35 year period. The application sought to mine three 10km2 each year at depths between 250m and 450m with an expected annual production of up to 1.5 million tonnes. In the first five years Chatham Rock Phosphate Limited planned to mine an area of 820 km2.The proposed mining practice was to retrieve phosphorite-bearing material by trailing suction drag-head and mechanically processing this on board. Phosphorite nodules more than 2mm would be separated from other material using sieves and logwashers. 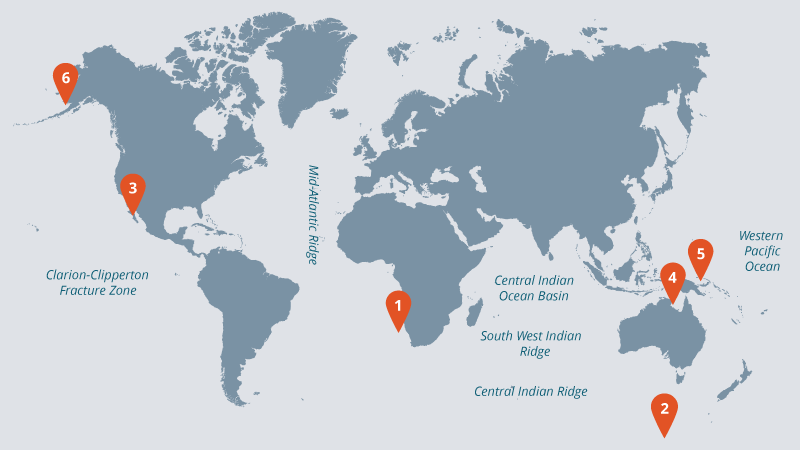 Waste would be released close to the seabed, using discharge (sinker) pipe with diffuser.The application by Chatham Rock Phosphate Limited drew widespread public attention, with over 294 submissions and large public hearings. A Decision-making Committee (DMC) was appointed by the Environment Protection Authority to decide on the application. On the 10 February 2014 the Decision-making Committee completed deliberations and refused consent. Environmental impact – It firstly found that the impacts of the drag head on benthic fauna would be highly destructive. These effects could not be ‘avoided, remedied or mitigated’. The mining would take place in the Mid Chatham Rise Benthic Protection Area, an area protected from trawling and dredging. The mining operations would destroy stony coral communities which were regarded by the Decision Making Committee as rare and vulnerable ecosystems. The damage would be irreversible’ altering the habitat permanently to soft sediment habitats. Furthermore, waste material and effluent returned to the seabed would have considerable effects on benthic habitats both within the mining blocks and the wider environment. Lack of knowledge – There was a lack of information to enable certainty on the impacts on the environment and existing interests. This was attributed to a lack of scientific knowledge of the receiving environment and of the proposed mining operations, regarded as ‘the first seabed mining project ever undertaken at such depths anywhere in the world’. With a lack of available knowledge, the Decision Making Committee was accordingly required to ‘favour caution and environmental protection’. Socio-economic impacts – The Decision Making Committee considered economic factors and the ‘likely economic benefit to New Zealand of the proposal’. It found that ‘seabed mining would be unlikely to generate more than a modest economic benefit to New Zealand and the quantum and distribution of that benefit remains uncertain. This had to be weighed against the significant and permanent adverse effects on the benthic environment’ and on other existing interests, particularly fishing industry. Mitigating impacts – The Decision Making Committee considered whether specific conditions that could be applied to the mining proposal could ‘avoid, remedy or mitigate the adverse effects of the activity.’ In this consideration it found that impacts ‘could not be mitigated by any set of conditions or adaptive management regime that might reasonably be imposed’. After weighing up factors prescribed to make a decision the Decision Making Committee found that the ‘application could not be approved either in part or in whole’. The application for marine consent was accordingly refused. In September 2014, Odyssey Marine Explorations (an American company) submitted an environmental impact assessment for its planned ‘Don Diego’ marine phosphate mine in Baja California’s San Ignacio lagoon, near Ulloa Bay.The project intended to mine 225,000 acres of seabed in five work sites. It was planned that each site would be exploited for 10 years, resulting in a 50-year long project. Overall, the project planned to extract 350 million tons of phosphate sand from the seabed.The project was opposed by many stakeholders including the Interamerican Association for Environmental Defense (AIDA), San Juanico residents, the Centro Mexicano de Derecho Ambiental (CEMDA), local fishing cooperatives, BCS Noticias, WildCoast and Save the Waves Coalition. These stakeholders raised significant concerns including potential impacts on Gray whales, Blue wales, Humpback wales and Loggerhead turtles as a result of noise, disturbance and radioactive releases from marine phosphate mining. In 2016, the Secretary of Environment and Natural Resources (SEMARNAT) denied environment authorisation for the Don Diego marine phosphate mining project. The environmental authority found that measures presented by the company for protecting Loggerhead turtles were based on inconsistent information. 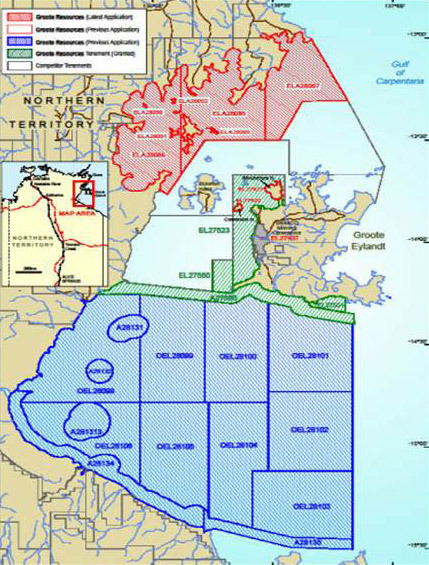 Furthermore, the authority found that the economic benefits of the project could not prevail over the protection of the natural resources of Ulloa Bay, particularly in relation to threatened species subject to strict standards of protection. The Environmental Protection Agency of Australia produced an Interim Report which recommended a highly cautious approach to seabed mining and the extension of the moratorium until better knowledge of impacts were available. Following the lapse of the moratorium period, the Northern Territory extended the moratorium for a further three years and placed a permanent ban on seabed mining in Groote Eylandt. A number of Pacific Island Nations, namely; Papua New Guinea, Fiji, Tonga, Vanuatu, Solomon Islands and the Cook Islands have granted permits for deep sea mining exploration. The Solwara 1 Project is the most advanced. 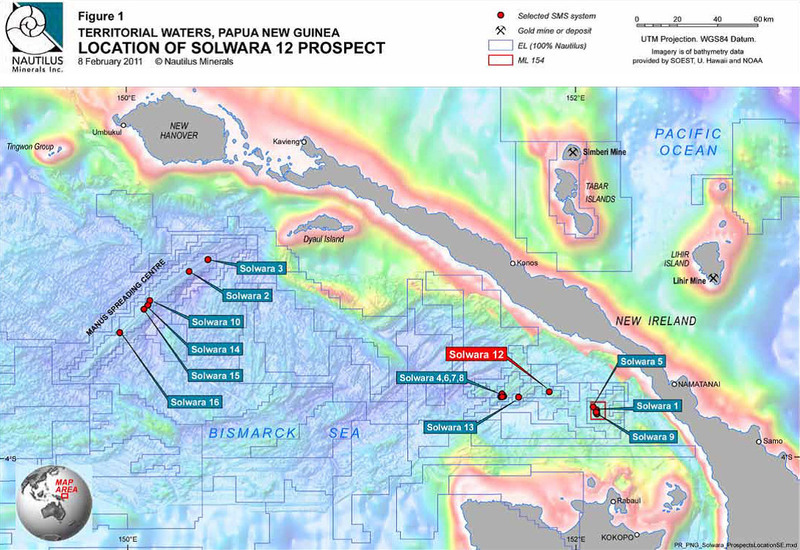 Nautilus Minerals (a Canadian seabed mining company) was recently granted a mining right for the Solwara 1 Project, for seabed mining in the Bismarck Sea. If this commences, it would be the first seabed mining operation of its kind. It appears that Papua New Guinea government’s rationale for granting these rights relates to the potential revenue that could stem from royalties. There has been significant opposition to the Solwara 1 Project from local communities and not for profit organisations. The Deep Sea Mining Campaign, an association of NGOs and citizens concerned about the likely impacts of seabed mining, has been highly vocal over the impacts of the Solwara 1 project on marine and coastal ecosystems and communities. Recently, the World Bank published a report titled ‘Precautionary Management of Deep Sea Mining Potential in Pacific Island Countries’. The report recommended that Pacific Island countries that are supporting or considering deep sea mining activities should ‘proceed with a high degree of caution to avoid irreversible damage to their ecosystems’. The report further stresses the need for strong governance arrangements to ensure that appropriate social and environmental safeguards are in place. Map illustrating location of Nautilus Minerals Solwara 1 Project and other Solwara Prospects. Photo credit: Nautilus Inc.
Bristol Bay has been described as America’s ‘fish basket’. It supports a $5.4 billion annual fishing industry, regarded as one of the world’s most valuable fisheries and provides up to 40% America’s wild caught seafood. It supports indigenous fishing communities and subsistence fishers throughout Alaska and Pacific Northwest. It is home to Native American sacred lands. The area provides considerable tourism opportunities and revenue, up to $100 million in annual recreational fishing and tourism activities.Oil and gas leasing was first allowed in Bristol Bay in 1986 when the U.S. federal government set aside 5.6 million acres of the southern region of Bristol Bay for oil and gas leasing. This decision was taken despite widespread opposition from fishing industry, local communities, environmental organizations and the state of Alaska. The Trustees for Alaska and other conservation groups, indigenous communities and the State of Alaska initiated court proceedings to stop the lease sale. The court case was unsuccessful and oil and gas leases were issued. Potential impacts to fishery resources and marine habitats, cited in independent impact assessment included ‘seismic testing, air pollution from ship traffic and the ever-present risk of oil spills’. In particular, impact studies states that ‘the area’s harsh weather, rough seas, ice and strong currents would make cleanup and containment of an oil spill difficult, if not impossible’. In 2010 the Obama Administration canceled the lease sale and provided temporary protection to Bristol Bay by withdrawing the area for consideration for oil and gas development until 2017. This was followed by steps to permanently protect Bristol Bay. On the 16 December 2014, the Obama Administration announced an indefinite Presidential Moratorium on oil and gas drilling in Bristol Bay using powers conferred under the Outer Continental Shelf Lands Act. These decisions followed decades of lobbying by a coalition of actors comprised of conservation organisations, recreational users, indigenous communities (Alaska Native Tribes), local seafood and tourism businesses and fishing industry. This coalition is known as the Fish Basket Coalition.